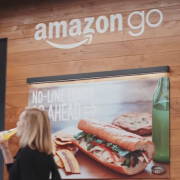 LOAKL.COM | Is it Time for Amazon Go? Or No? You are here: Home / Retail / Is it Time for Amazon Go? Or No? Is it Time for Amazon Go? Or No? When I first read about Amazon Go, a futuristic new Amazon store rumored to be coming sometime in 2017 (actually it opened today, 1/23/18), and learned that cashiers were to be replaced with an app that tracks what you buy at checkout—frankly, I was alarmed. This is not my idea of a friendly, neighborhood store. While the video makes shopping look effortless and hip, the reality of unmanned urban storefronts is sure to be different from the idealized version presented here. So, what could be wrong with a concept like Amazon Go? Not only does this scenario rely heavily on automation, eliminating jobs for cashiers and other retail positions, it includes cameras with “computer-vision technology” to capture what consumers are picking up off the shelf and monitoring them the entire time they’re shopping. If it makes you feel uneasy, you wouldn’t be alone. Most people enjoy a certain amount of anonymity when they shop (think about how creepy web ads are that seem to immediately pop-up when you casually stumble across something online). A recent survey found that consumers are a bit skeptical about the concept of Amazon Go and whether or not it would solve more problems than it introduces. There are so many ways to improve shopping and make it a better experience. Removing and replacing the people who work in retail stores is not the answer. Compare the proposed Amazon Go shopping experience with the one you’d find in an Apple retail store. At an Apple store, you can expect friendly people to make eye contact and greet you when you walk in, and staff who are knowledgable about the products and can answer questions. With mobile checkout devices, Apple staff can check you out quickly and efficiently. One leaves impressed and wanting to return. Designing for human interaction isn’t hard. It just takes a commitment…to humans. While no doubt it may seem to make financial sense to increase efficiency by eliminating humans’ jobs, I think the question is: Do you want to be in a store with minimal interaction with other humans? Or do you find interacting with people when you’re out kinda comforting? What if you had a question or something happened in the store and you found yourself needing assistance? I know I prefer to be around people who are looking out for me, not monitoring me through a device. It’s one of the reasons I prefer to shop local. I appreciate the scale and convenience of having access to what I need in my neighborhood and often times, knowing the people there makes all the difference. The coffee and sandwich shop around the corner is an independent corner grocery store run by someone who immigrated to the U.S. many years ago. The store’s business has already been hit hard by the Trader Joe’s that opened a few years ago. I’ve known the owner of this corner grocery store for twenty years. He’s watched my son grow up. My Dad visits regularly and knows him too. In fact, he always asks after my Dad and my son when I go into buy a bagel or coffee. Do I want his store replaced by an Amazon Go? No way! What about your favorite local stores? How would they be impacted by a development like Amazon Go? This post has been updated and was originally published in 2016. January Asks: What Do You Really Want? February is Here— Are You Still Committed to Your Resolutions?